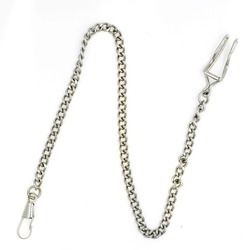 Home › Watch Accessories › Pocket Watch Chains › SHUHANG 10pcs 34CM ..
As always, thank you for fast shipping and great quality! Nice product, good customer service. Nice finish. Good customer communication. 2,The buyer is responsible for any tax and/or duty charged by their country. 1.All items are checked and packed in good condition before dispatch. 2.If you find any defect in our items, please contact our customer service within 7 days of receipt item. 3.Return items must not be used or have any sign of abuse or intentional damage. 4.Buyer is responsible for all return shipping charges. We will leave positive feedback to buyer as soon as buyer pays for the item and leave positive feedback for us.We hightly appreciate that you can contact with us before you leaving Negative feedback or Neutral feedback .We will offer help to resolve your problems as fast as possible. Leaving negative feedback doesn't solve the problem,on the other hand,it might create more misunderstanding. If you had got the item and feel satisfied with it,please leave us five scores positive feedback. We aim to answer emails within 24 hours and happy to offer product assistance and delivery information.